The Isa Cultural Centre (ICC) was inaugurated under the patronage of His Majesty King Hamad bin Isa Al-Khalifa, on 18th December 2008. 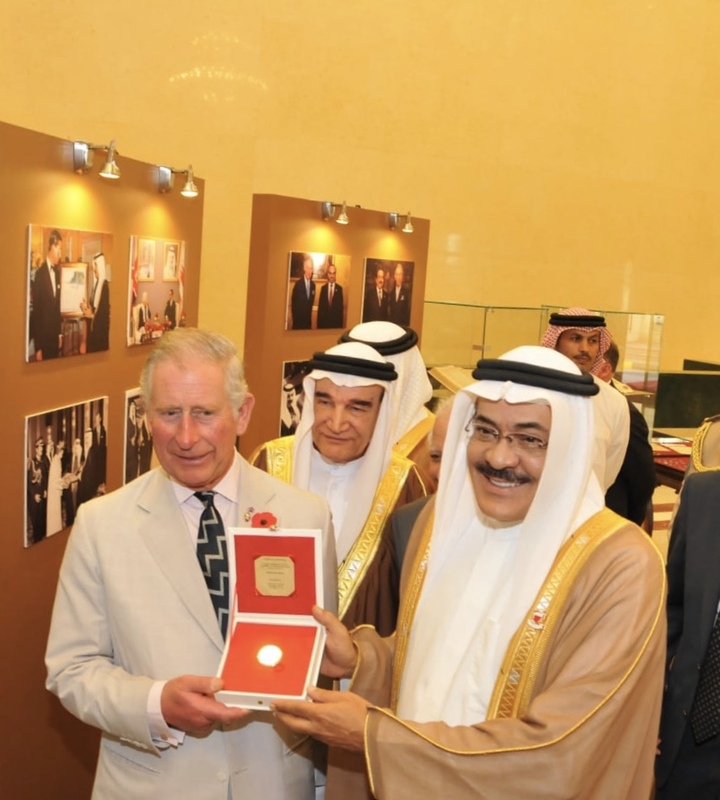 The establishment of the centre is a vivid example of cohe sion in the Kingdom of Bahrain, between the leadership and the people, on official and private levels. Dr. Shaikh Khalid bin Khalifa bin Daij Al Khalifa is the Vice-Chairman of the Board of Trustees and Executive Director of Isa Cultural Centre and the Chairman of the Board of Trustees of King Hamad Global Centre for Peaceful Coexistence in the Kingdom of Bahrain. He has also served on the Shura Council, where he was elected, during the 2002-2006 and 2010-2014 legislative sessions, as the Head of the Foreign Affairs, Defense and National Security Committee. of the International Academic Affairs Committee at the University of Oxford, UK, member of Board of Directors of Education and Training Quality Assurance Authority of Bahrain, member of the Bahrain National Committee of Education, Science and Culture. He is also a member of Board of Trustees of the Arab Thought Forum, appointed by HRH Prince Al Hassan Bin Talal of Jordan, and he is the Vice-Chairman of the Board of Trustees of the “Coalition of Arab Thought Centres”. In recognition of his efforts for promoting the concept of “Cultural Diplomacy” and the spread of peace, Shaikh Khalid received the Mediterranean Prize for Culture and Peace for 2018 in Italy. Congratulations on receiving The Mediterranean Award of Culture and Peace in 2018… please give us some background about the award and your career in culture and peace-making. The Mediterranean Award is a given to individuals who serve in peace-making and “cultural diplomacy” through sharing knowledge, and by spreading the ideals of tolerance and fighting terrorism. Our goal is to achieve a higher standard of knowledge and co-existence internationally. I would say that to be acknowledged for this award, the individual’s work must appear globally. 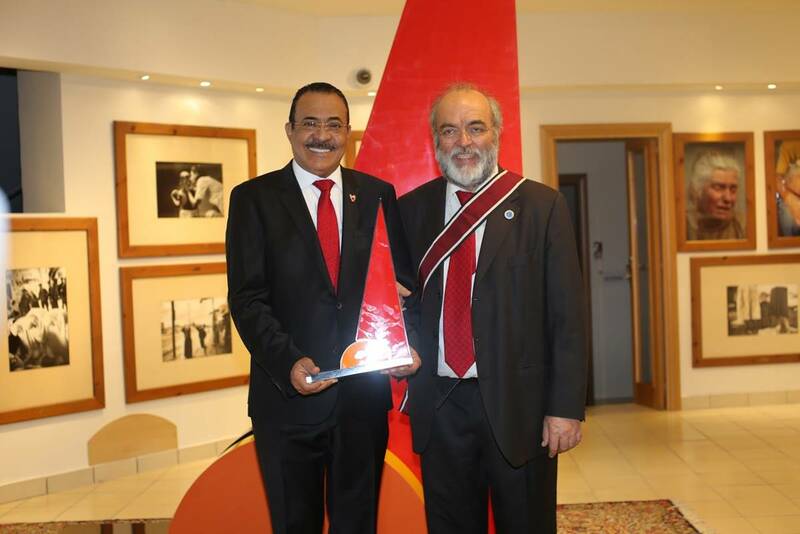 I think, I received the award because of my many lectures as a professor of history and especially through my chairmanship of the Foreign Affairs and National Security Committee in the Shura Council, which I served as a member of from 2002-2014. We were like ambassadors carrying the flag of peace and communication around the world- Japan, Europe, around Asia… We even conducted a few conferences here at the Isa Cultural Centre, including the “Youth Against Terrorism” conference, conducted by youth themselves, and the “history of tolerance” conference, featuring all places of worship in Bahrain presenting to our guests from around the world. We used all the tools of communication at our disposal in conducting our diplomatic work, including social media. Can you please expand on the definition of “cultural diplomacy”? And given your career in education, in the University of Bahrain as a professor and Vice-President and currently on the board of the Education and Training Quality Authority, what is your opinion on the role of education in social development and peace-building? Cultural Diplomacy revolves around the firm belief that in fighting obstacles to peace, the most effective weapons are education, awareness and communication. In my career in education, my ultimate concern is with youth empowerment- countering bigotry and intolerance in order to empower and raise awareness among the youth of the tools they have to grow and contribute to society. In the last decade, religion has been used as a tool for fanatics and we were focused on protecting young Muslims from this. Take for instance the war in Syria- Damascus remains safe. Why? Its population is the most educated, and education improves communication and enforces peace. You can find the same in Libya- the fighting begins in the province… you will notice this trend in all conflicts, they fester in areas with a lesser quality of education, where the youth are easy pawns for fanatics and terrorists with violent agendas. An example of educational and cultural diplomacy work is the conference I mentioned “youth against terrorism”, where experienced youth spoke to their peers about the mindset necessary for independent thought and ultimately, for peace. Through education, open-minded and awareness flourishes. This creates the climate necessary for peace and for the forward development of society. You have a PHD in Economic History.. please explain to us Bahrain’s recent Economic History and how this knowledge can predict the future. This is an interesting subject as the present is the product of the past and we can learn from it to predict the future. Bahrain was a well-known pearl market; pearls were our major commodity. Through this trade, we established links to East Saudi, Eastern Africa, Turley, China, India and more. Bahrain gradually became a commercial centre: with one product and the communication center that supports it. Today, we call this communication centre “services”, it includes banking services, advertising and much more and the major commodity which used to be pearls is now oil. In this way our current economy is an exact reflection of the past. Oil is a fact we have been blessed with, but we know that to continue this structure, we must develop the trade services and Bahrain as a commercial center. It is the same lesson then as now. You are a founding member of the Isa Cultural Centre and Its Vice-Chairman.. Briefly tell us about the center’s services.. The Isa Cultural Centre is an umbrella that hosts many linked departments, all working toward a higher culture for Bahrain. Of course, the first is The National Library. We also have a Children’s Library and run an Electronic Library. Under the ICC is also Historical Documentation Centre and the National Archives, both which hold all historical publications and documents. Lastly is the department which runs the Isa Award for Service to Humanity, which brings attention to community members working tirelessly for peace and development in The Kingdom. As a life-long advocate for peace, what in your opinion are the largest challenges to peace in the region? What are the best safeguards we have to these challenges? His Majesty King Hamad bin Isa AlKhalifa said in one interview, “ignorance is the enemy of peaceful co-existence.” Illiteracy breeds violence and corruption, good education breeds discussion and development: it elevates society. Bahrain is blessed by God to have the elements of peace within society. For one, we are a trading center and a culture of communication with the world is natural to us. We have a good standard of living, and the rulers have always been open to all religions and sects; in fact, we are the first country to allow the building of temples: the the first Hindu community dates back to 1512 and the Krishna temple in Manama was built over 200 years ago. In this way too, trade and cultural communication along with education are our paths to peace. Kindly share with us some words about your relationship and pass on to our readers a few treasured lessons you gained from working beside the late Sheikh Abdullah bin Khalid AlKhalifa- an icon of history, peace, justice and knowledge, and the honorable Chairman of Isa Cultural Centre. My first professional contact with His Highness Shaikh Abdulla bin Khalid was in 1983 at the first international conference on history, “Bahrain Through the Ages,” which Shaikh Abdulla organized. I presented a paper on the history of Bahrain and was so proud when Shaikh Abdulla commented on my research during the presentation. Since then I began working for and with Shaikh Abdulla on documenting the history of Bahrain. He was a master of history who was a mentor to me in the field of historical science and constantly enlightened me on facts. In 1980, through the vision and order of His Majesty King Hamad bin Isa, who was at the time the Crown Prince of Bahrain, Shaikh Abdulla established The Historical Documentation Centre, through which he documented and promoted the field of Historical Research in Bahrain. As a professor of History in the University of Bahrain at the time, I worked closely with the center and was one of its researchers. In 2002 when His Majesty the King ordered by Royal Decree the establishment of the Isa Cultural Centre, he appointed HH Shaikh Abdulla bin Khalid to lead the team and supervise the establishment. I am honored to have been on the board for eight years, where I worked closely for Shaikh Abdulla as our team leader. In January 2015 I was appointed by Royal Order as the Deputy Chairman in the Board of Trustees and Executive Director of Isa Cultural Centre under HH Shaikh Abdulla as the Chairman. 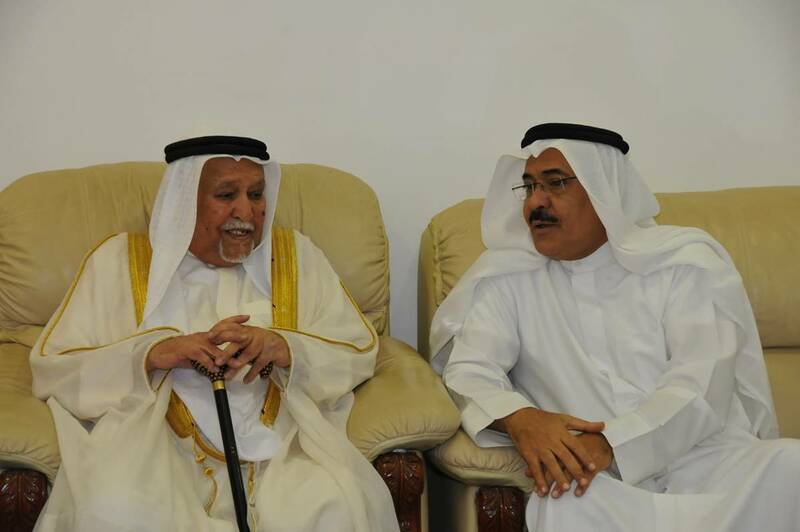 Today I can easily state that H.H Shaikh Abdulla bin Khalid is the father of History in Bahrain. He published the most important books and articles on Bahraini History to date, and represented Bahrain in almost all conferences on history. He was one of the founding members of the Organization of GCC Centers and headed many of its meetings and was one of the most sought out and respected historians in the entire GCC region. In the many years I worked with and for HH Shaikh Abdulla bin Khalid I came to know him personally. He possessed a unique character that was equal parts a wise, deep thinker and a precise, practical, doer. In fact, he was so straight-forward and simple that a person could feel like he knew him for many years even if they had just met. The mark he left on Bahrain is so deep and large that I have no doubt his legacy will live through all the people he touched and many generations to come.